Home / Index category / Nora Mork next two years at CSM Bucuresti! Alongside Gyori AUDI Eto KC, the most ambitious team in European handball, CSM Bucuresti have caught a big fish for the upcoming season. One of the world’s best players, Nora Mork, will join Romanian project from the next summer according to the two years deal. “I’m excited to announce that I to have signed a two-year contract with CSM Bucuresti, a club that believes in me and my qualities,” Nora Mork wrote on Instagram. “I’m more motivated than ever to get back on the court, develop myself as a player and to continue my career with some of the best players in the world. I really have high hopes for this team and believe we can do great things together over the next seasons,” she added. Mork has problem with her knee which put her out of the court in the last year. The 28-years old will be a part of great team capable to play for the European title. 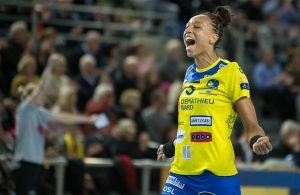 Next Story → VOX POPULI: Five things which can make progress in handball? CSM Bucuresti defeated in Germany!